Ideal for use in larger electrical enclosures with higher heat requirements, Pfannenberg FLH series of Fan Heaters (250 to 400 Watts) have an integrated fan that assists the natural convection and provides fast distribution of the heat in the electrical enclosure. The fan heaters are used in combination with a thermostat or hygrostat, and are designed to protect electronics from moisture or corrosion caused by high humidity, low temperatures or condensation caused by rapid temperature change. Need more than “just” a Heater? Pfannenberg also offers a range of fan heaters with an integrated thermostat: PFH-T (200 – 1200 Watts) dedicated to larger enclosures and with flexible mounting options. These fan heaters with adjustable thermostat are especially designed to protect electronics from the effects of low temperatures such as corrosion, freezing or condensation, which can damage critical components within a control enclosure. /wp-content/uploads/2016/12/FLH_Fan_Heater1.jpg 200 200 Sue Kuhn /wp-content/uploads/2015/11/logo_retina1.png Sue Kuhn2016-12-16 09:58:132019-01-14 11:48:30How to Choose the Best Heater for your Electrical Enclosure? Pfannenberg products ensure that manufacturing operations are up and running – especially during the holidays when many manufacturing lines are always online. Read below on just a few example applications on how Pfannenberg supports these product lines and keeps them running. The go-to holiday candy. As a child, they are passed out and enjoyed by many, and as adults they are necessary for almost any holiday decoration. This peppermint candy involves very delicate care when being processed. There are many differences in temperature to heat up or cool down – just enough that it maintains flavor and will not ruin the product quality. All throughout the manufacturing process of candy canes, temperatures are critical. At certain stages, the temperature needs to be increased to help form the canes, then at other parts it needs to be cooled so that it can be mixed to perfect flavor and coloring. Artists have to create such artwork which is then etched onto copper cylinders that are bathed in a liquid bath of chromium, which galvanizes the copper to protect it from wear and tear. From here these rolls each have a various piece of the final wrapping paper artwork. Each color has its own roller. The paper will go through a series of various printers where it encounters the artwork on the copper rolls for the different colors. These metal rolls need to be highly controlled with temperature. Too hot or cold could cause the paper to stick to these rolls and cause a paper jam which leads to loss revenue and downtime. As part of a complete solution Pfannenberg’s CC Series Chillers help to control the temperature to the print rollers and Pfannenberg’s Air to Water Heat Exchangers provide proper cooling for the control equipment operating these large machines. To complelent our full product line, Pfannenberg’s Signaling products are needed at every stage of the manufacturing process to alert employees of a problem. Pfannenberg’s Signaling Solutions help the employees to be able to hear and see exactly where the problem is occurring (which machine) and what problem is occurring (what action is need). When it comes to the vacuum packing machines they operate at very high speeds, processing many turkeys in a short amount of time. It’s critical that the control enclosure electronics do not overheat. Proper cabinet temperature control is essential to keeping production on schedule. To keep these electrical enclosures cool, the processing facility has several options. If using traditional enclosure air conditioners (cooling units) then our washdown NEMA Type 4/4x DTS 3000 Series Cooling Units would be a good solution. For a more economical and maintenance free solution our stainless steel PWS Air to Water Heat Exchangers could be used with existing water lines or a Pfannenberg Packaged Chiller. These both would be perfect options to protect the electronics and drives that are so important to keep everything online and running. Pfannenberg’s enclosure cooling solutions and chillers aid in meeting the high demands of poultry processing equipment during the peak season helping to ensure there is not a turkey shortage on the biggest turkey day of the year! Preventing enclosure overheating in the summer can be a challenge for many factories, where temperatures can rise fast during hot days! The high summer temperatures are often the cause of overheating of electrical components located inside the enclosures reducing their lifespan, while also contributing to downtime and repairs. Automation plays a critical role in the manufacturing of ice cream. Numerous electrical enclosures contain the critical electronics (VFDs and control components) to operate the machinery ranging from mixing to the final packaging. Even though these enclosures are found within a relatively cool environment, the temperature inside the cabinets needs to be maintained. Without proper enclosure cooling these electronics may overheat, bringing operations to a halt. Pfannenberg’s PWS Air to Water Heat Exchangers are ideal for cooling electrical components found in food and beverage processing facilities. The units can utilize existing cooled liquid while saving energy costs vs, traditional compressor based AC cooling units. Our cooling solutions make this cool summer treat possible. Be sure to visit us at IBIE 2016 in Las Vegas, NV — October 8th-11th at Booth #9247 to learn more about our closed loop liquid cooling solutions. /wp-content/uploads/2017/11/IceCream1.jpg 1200 1600 Sue Kuhn /wp-content/uploads/2015/11/logo_retina1.png Sue Kuhn2016-08-25 11:02:352019-01-14 12:08:30“We All Scream for Ice Cream” - Pfannenberg's Thermal Management plays a key role in a favorite summer treat! Hot dogs – a staple summer treat that brings back memories of family cookouts and baseball games. It is an American favorite summertime food! Hot dogs go through a series of complex processes that combine the ingredients into their delicious final form and Pfannenberg’s PWS Air to Water Heat Exchangers are perfect to keep things running. The first step into creating one of the most loved foods is the preparation of the meat. The meat is cut into small pieces and is placed into a large mixer. These mixers have chopping blades to further cut the meat into smaller sizes. Here the raw ingredients and flavorings are added. All are mixed until the mixture is a smooth paste consistency. Processes like this can require large control panels to operate the system and Pfannenberg’s PWS Air/Water Heat Exchangers are ideal for cooling your electrical components. Pfannenberg’s Air/Water Heat Exchangers utilizes chilled water, that is readily available, and an internal fan to provide cool air to prevent critical electronics from overheating. Click Here to read “Chillers for X-Ray Machines – A Food & Beverage Success Story”. Closed Loop Cooling and particularly Air to air heat exchangers are used when the complete separation between the enclosure and the environment is required and the internal enclosure temperature to be cooled can be higher than the ambient. The air to air units have a rating showing how much heat can be removed based on the difference in the ambient and the internal temperatures. This is traditionally rated on W/°C which is the watts of heat that the unit can remove per temperature difference in °C. How do I know if an air to air heat exchanger is the right product for my application? If the ambient temperature is lower than the desired temperature inside the enclosure. If a total separation between ambient air and enclosure air is required. To properly size an air to air heat exchanger you must know the required cooling capacity in Watts, target temperature rise over ambient and the dimensions of the heat exchanger and enclosure. 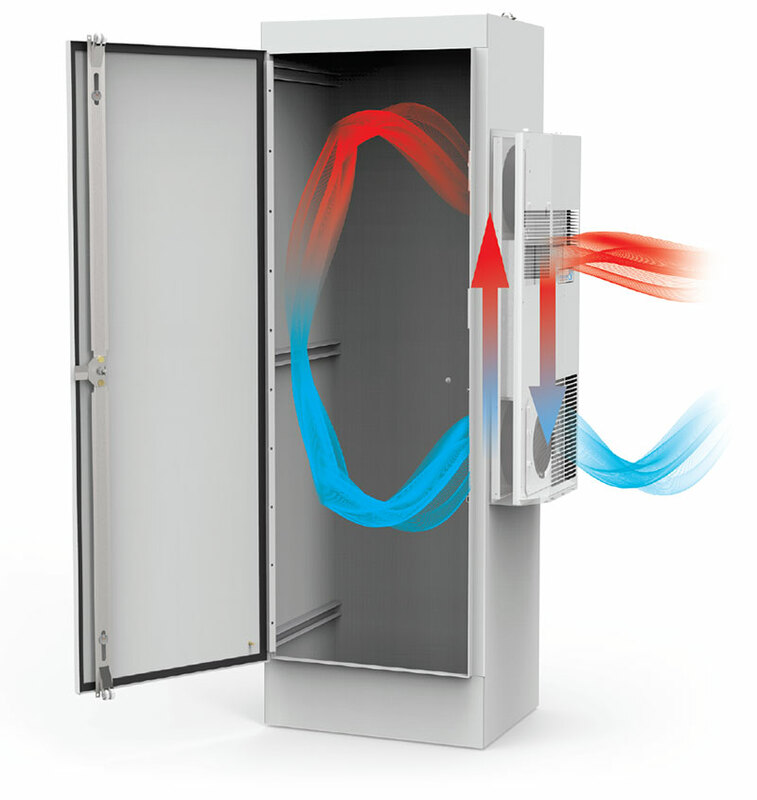 > Pfannenberg utilizes watts of heat that the unit can remove per temperature difference in °C. > Customers should use their own application temperatures to determine the proper cooling capacity of the system. The max ambient is 35 °C (95 °F) and the max internal temperature that the system can take is 45 °C (113 °F). Can be used when the temperature difference is 10 °C. If you apply this temperature difference to the rating of the air to air unit you will get the total amount of heat that can be removed. A unit rated 100 W/°C could remove 1000 Watts (100 x 10) of heat under these conditions. Closed Loop Cooling with air to air heat exchangers is the most efficient cooling solution as cooling with ambient air is the most economical type of cooling! Pfannenberg εCOOL Air to air Heat Exchangers feature an energy efficient, minimal maintenance design. Installation and maintenance of these units requires much less time compared to other closed loop Thermal Management solutions.